Observation - Ghost Moth (male) - UK and Ireland. Description: Disturbed from the long grass on the flower meadow during the day. Around 45 mm wingspan; bright white colour is typical of the male. Disturbed from the long grass on the flower meadow during the day. 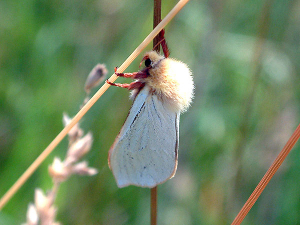 Around 45 mm wingspan; bright white colour is typical of the male.